I arrived in Burlington at 6:30 am to get an early start, Justin along with me to help out and provide moral support. 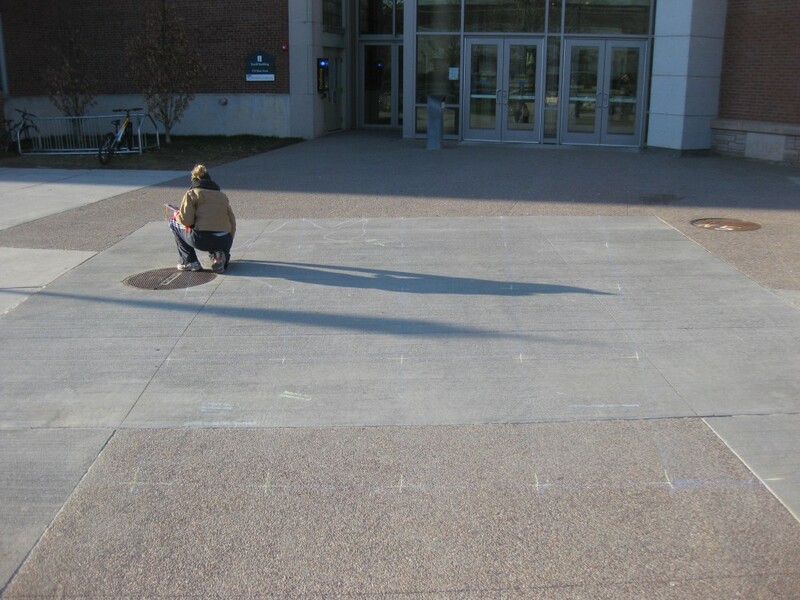 After throwing down a quick chicken outside of the UVM Davis Center with cheap Crayola sidewalk chalk (and fingerless mittens, it still being about 28 degrees outside), I realized just how far one big old stick of chalk…doesn’t…go and began to panic. 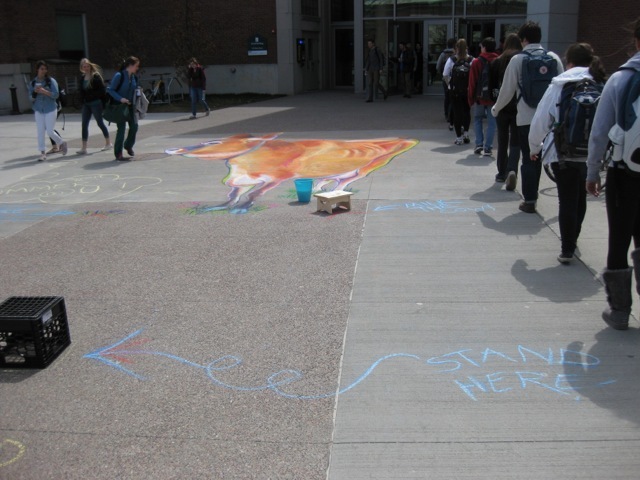 We arrived set up with eighty-four sticks of chalk and three boxes of cheap artist pastels, but only about five of those sticks were yellow-orange. And here I had a plan for a 23-foot tall, predominantly yellow-orange cow. This is where the moral support comes in. While I began to angst about the inevitability of extreme orange shortage, Justin shrugged it off and kept things completely calm as we laid out the grid. 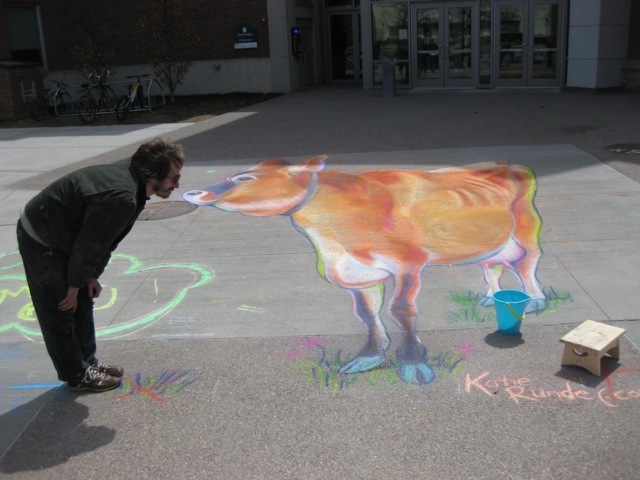 The aim was to get Huckabee – a local jersey cow from Blythedale Farm up in Corinth, VT – to pop right up out of the ground in 3D. The grid stretched her three times as tall as her estimated regular height and two times as wide – that’s a tall cow right there…and a lot of orange. We snapped the grid into place with Justin’s chalk line (and yes, he was the measuring guru, too), and while he traced over all the grid corners (more cheap Crayola), I began to outline on the grid, starting with Huckabee’s head. (The original Huckabee has horns, but we removed them for the picture as a vast percentage of the population naturally equates horns with male cows only and gets confused seeing udder and horns on the same animal.) You know that bony knob cows have on the top of their hands? It is bizarre drawing one of those about a foot and a half tall. Once the outline was all drawn out – and panicked over, as her head still seemed so disproportionately large – I took my first piece of yellow orange to see just how far I could spread it. The piece did not make it more than a few feet before it had broken into impossibly small orange bits. More angst. Justin suggested I keep using the tiny bits, but have you ever scratched your nails on a chalkboard? Imagine doing the same on concrete over and over again as you try to stretch your orange as far as it can possibly go. Leaving unproductive angst to the side, I decided to start with the head, where I could block in white and forget about orange for a little while. Once her nose was drawn, Huckabee’s head looked much more proportional. Next, I blocked in blue for the black pattern on her nose. 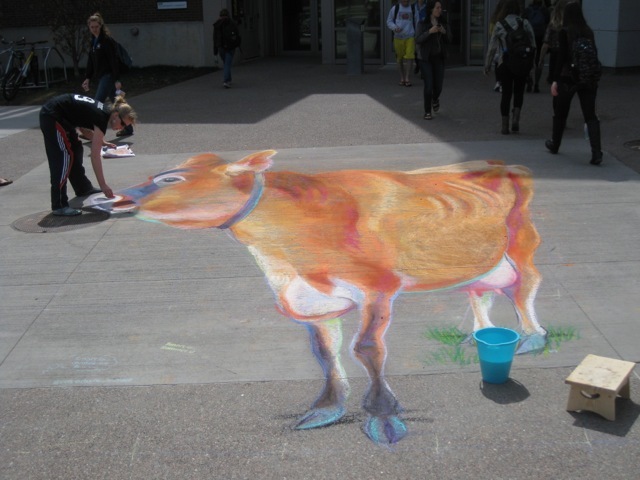 Here is where I need to make a quick plug for Eternity Arts chalk. 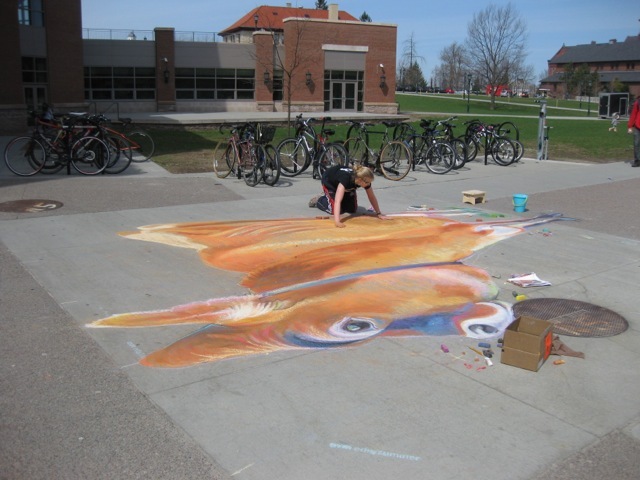 Apparently, a lot of sidewalk artists swear by cheap artist pastels (like Reeves, Koss, Leow-Cornell), but when you are working large scale, those feel pretty ridiculous. 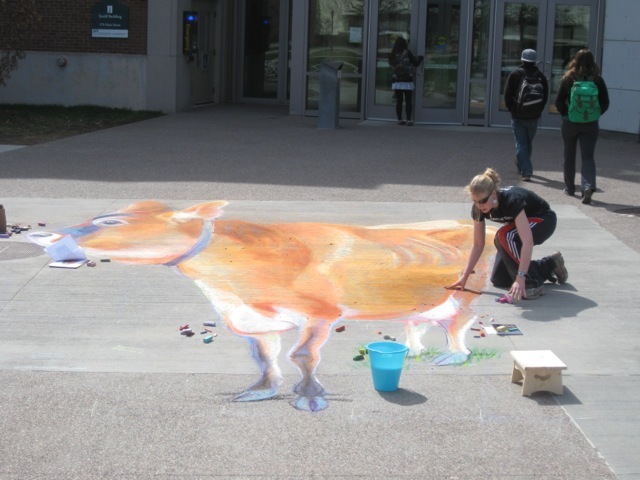 Eternity Arts sells big old pieces of beautifully saturated, soft-textured inch-thick sidewalk chalk, the way it should be. This is a beautiful blue, and it helped get my morale back on track. From here, I went into the focus zone and just threw down color for the next several hours, trying not to listen too hard to the first passersby commenting (‘Omg, why would anyone do that?’) and not get too swollen by the later passersby, who were able to see the cow actually beginning to take shape and were much more impressed and less convinced I was just someone there scribbling on the sidewalk at the crack of dawn for the heck of it. Around the time I finished blocking in colors for the head and introduced Huckabee’s collar, my work began to remind me a little too strongly of middle school pastel work. Back when I was first learning to blend colors, the cool, easy way I figured out was to smear the colors together with my fingers. Over time, I realized how finger oils would sometimes sneak in, not to mention how airbrushed this work looked. So I foreswore all blenders, finger or paper, and now do all my blending with meticulous pencilwork. 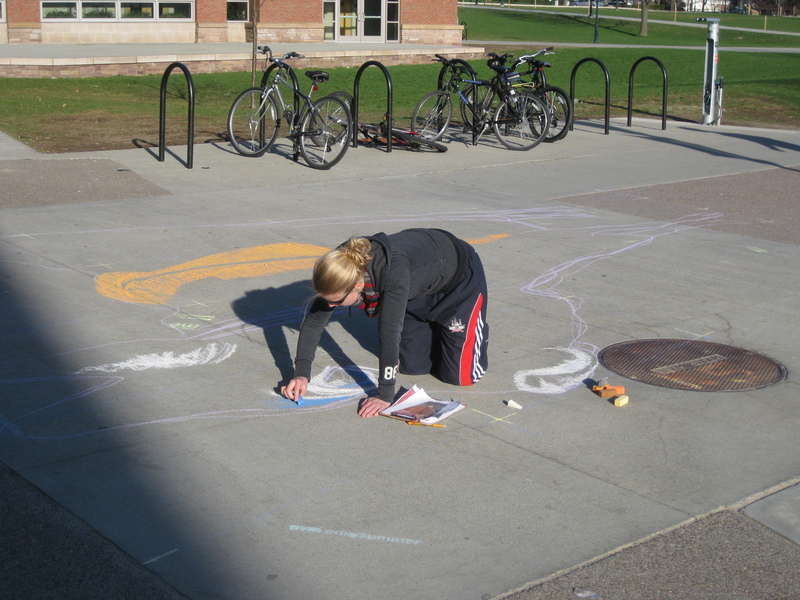 Except that when you are stretching your chalk as far as you possibly can, what do you have to do? Spread thin colors and not just finger-blend, no, you have to blend with your whole hand. This compromises color depth immensely. I am all about color: angst again! Nothing for it but to keep moving, though. 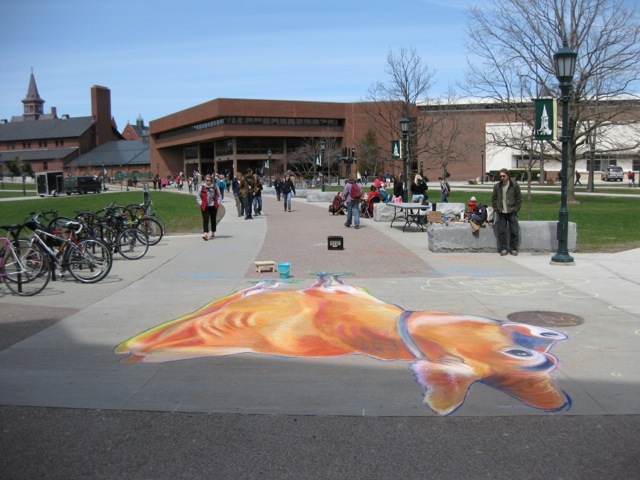 The orange situation looked dire, so Justin went out at about 9 am to comb Burlington for orange chalk. I used up the last of my pieces, and since apparently the art stores do not even open until 10, I faked it with brown. Justin finally arrived with a pile of bright red-orange pastels, which I immediately ground into my brown along with some Naples yellow to try and blend the belly to match the rest. Once this blocking was done, it was time to take risks and have fun! This is my favorite part of any color drawing: the color play. I love to put bright, highly-saturated, unlikely colors here and there and step back to see the effect. Bonus points for not being able to notice them immediately. 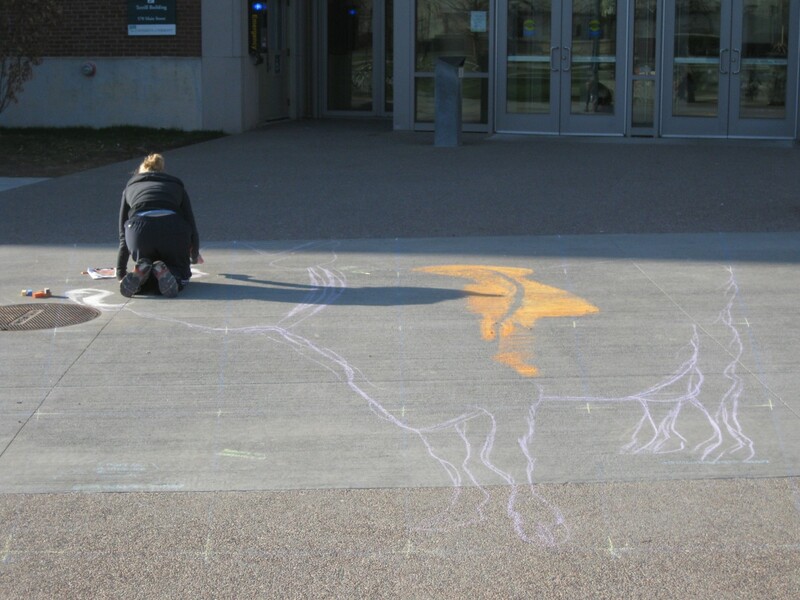 After sneaking in some aquamarines, purples, and red, I was followed by a group of preschoolers all over the front walks of the Davis Center as I drew different chickens. 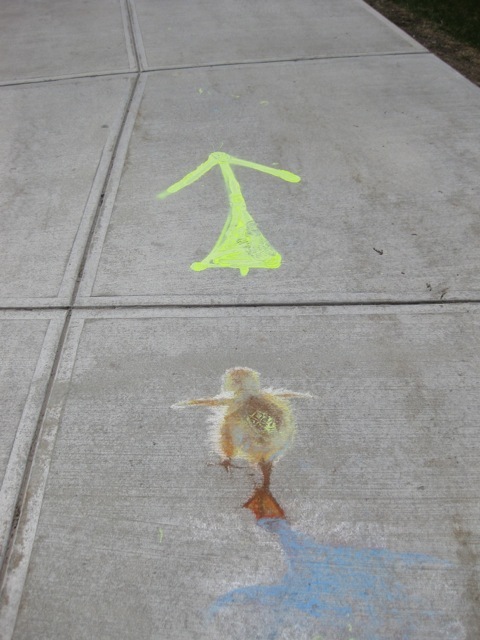 The favorite seems to have been the duckling. These kids had actually just hatched—or at least inherited—a few ducklings in their class, so they were extra excited. When I came back from the ducks and chickens, I decided that even with color help, Huckabee was not quite jumping out of the pavement yet, so I did some outlining with navy blue. 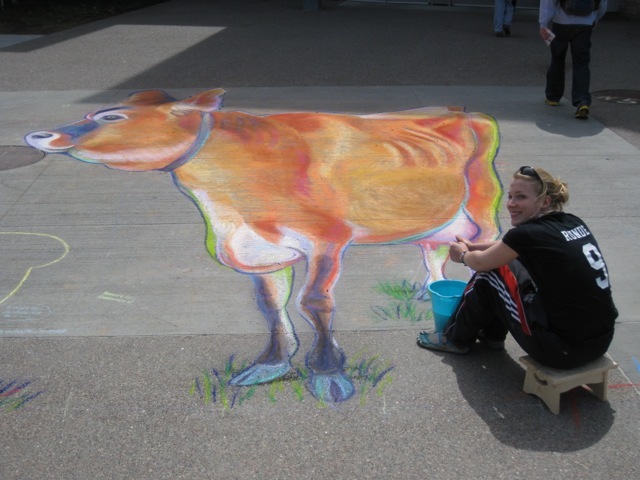 By this time, the New Breed interns had come with a milking stool and bucket for people to sit on so they could be photographed milking the cow. By this time, I also realized that the perspective was a little squashed on top. Huckabee’s head is actually too skinny! You’d never know to look at her from the top down. Oh well—next time. 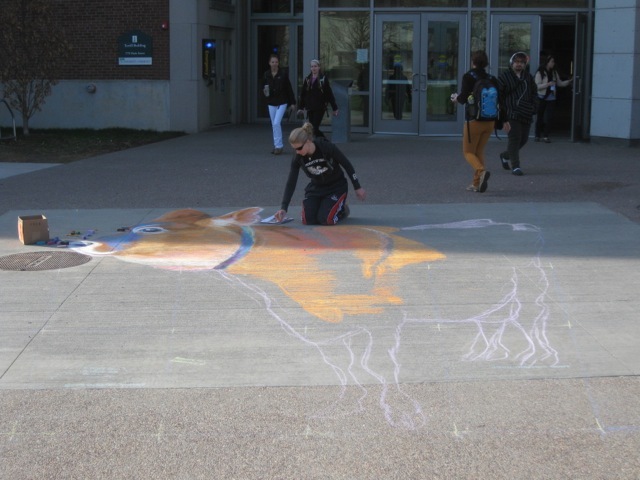 In the meantime, a few passersby had actually (and I kid you not) not noticed the hright orange 23-foot cow and walked right over it. Others had noticed and still walked right through. The ducks and chickens got much worse treatment (notice that big yellow footprint in the middle of the duckling), and for all of this I was really pretty surprised. Are people not looking where their going, or do they simply not care that they are stepping on something colorful and representative of an actual living thing? Kind of appropriate for Earth Day, really—isn’t this the same attitude we show towards the earth that has led us to such an environmental dilemma? 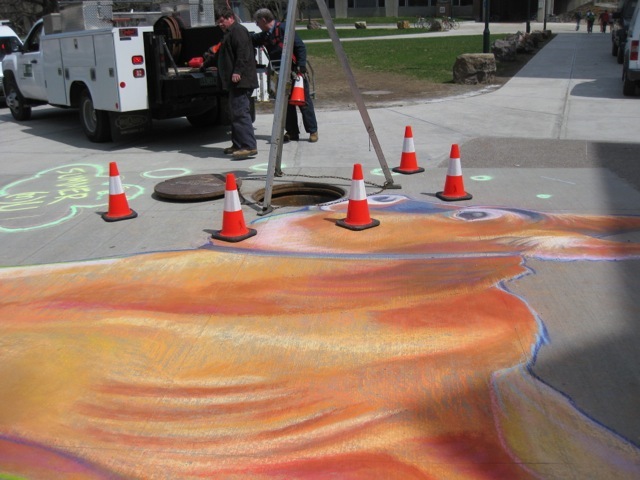 Then, because a trodden-down duckling was not enough cause for concern, the UVM maintenance folks showed up to work on the sewer…right next to Huckabee’s nose. They carefully backed up to the art, removed the sewer cap (including the very tip of Huckabee’s chin), and set out cones around her. To give credit where it is due, though, they were very careful and didn’t disturb the colors too much at all. I’m very impressed. In the meantime, we realized we had to make the whole ideal-point-of-viewing part of the whole project more obvious to the people going by, so we put up suggestions for where to stand and where to be photographed, which turned into a lot of fun for many of the students passing by!